If the owner of a sole proprietorship dies, then the business also ceases to operate, because state laws and IRS rules do not consider a sole proprietorship to be separate from the individual owner. While carrying out the terms of a will, the executor or representative of the owner has to wind down the business by performing specific steps intended to avoid any future legal or tax complications. If the owner kept up business licenses or registrations, the representative needs to cancel them by contacting the agency that issued the license. In most states, the office of the secretary of state handles business registrations, which must be notified if a business closes down. Any "doing business as" (DBA) registrations should also be cancelled. Since the owner of a sole proprietorship does not need to draw up operating agreements, it is relatively easy to close down a sole proprietorship, in comparison to partnerships, LLCs and other business entities. The representative needs to notify the Internal Revenue Service and the state tax authorities of the owner's death. A final tax return needs to be filed for the year the death occurred, to cover the closure of the business. Sole proprietors report their business results on Form 1040, Schedule C. Any taxes due on business income must be paid out of the estate, if possible, before any disbursements are made to creditors or beneficiaries out of the owner's will. The representative should attempt to collect any accounts payable, either on his own or through a collection agency. In his will or in a trust document, the owner may have left instructions on collections, as well as on liquidating assets. 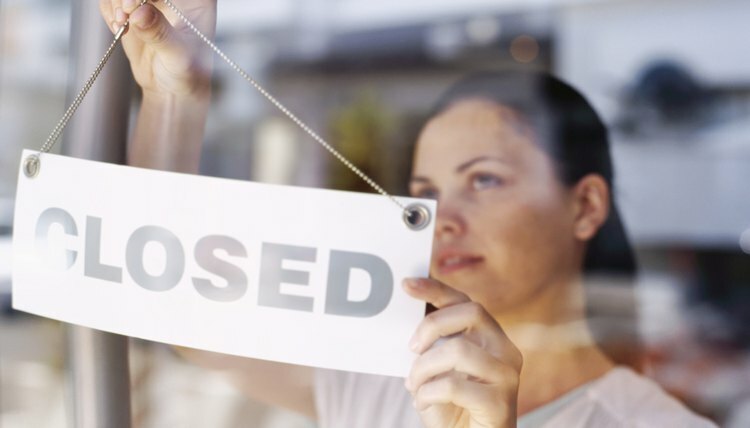 Following any instructions, the representative sells off business assets and inventory, and then notifies clients, customers and creditors of the closure. Liquidating assets raises cash to pay any debts or loans to the business. In addition, the representative should close any bank accounts or investment accounts, because taxes will become due if interest continues to accrue on investments. The final step is to repay creditors out of the remaining assets of the business. Sole proprietors are personally liable for the debts of their businesses. Secured creditors, such as auto lenders, have a claim on the assets of the business and should be paid first. The representative pays accounts payable and unsecured creditors out of any remaining assets. If the assets are not sufficient, then the representative should contact the creditors and work out a repayment agreement. Without a repayment agreement, unpaid creditors can file a claim on the owner's estate, which will tie up the estate in probate court. Although the sole proprietorship has closed with the death of its owner, its assets may have been transferred to a beneficiary by the terms of a will or trust agreement. The beneficiary is then responsible for repaying any debts, and he serves as custodian of the business assets, if any remain. A beneficiary may choose to continue a viable business, but it can no longer be registered or operated in the name of the deceased. The new owner becomes personally responsible for taxes and debts, if he chooses to establish a new sole proprietorship. A sole proprietorship is a type of business organization that has a single owner. This type of organization is popular due to how easy and comparatively cheap it is to form. The sole proprietor is personally responsible for the business’s liabilities, so if the business lacks the resources to settle its debts, the owner must pay off the liabilities using his personal assets. When a sole proprietor dies, the business usually terminates as well, since a sole proprietorship is so closely tied to its owner. However, if the sole proprietor carefully plans his estate, his business can survive in some form after his death, either in the hands of his heirs or through a third-party purchaser.